Lack of adherence (or non-compliance) to the drug dosage regimen is a large and growing problem for the healthcare industry, across many indications, patient demographics and even where the disease is potentially life threatening. Adherence to inhaled drug therapies falls near the bottom of the league, with an average of only 40% to 60% of patients with COPD (Chronic Obstructive Pulmonary Disease) correctly adhering to the prescribed regimen and only 10% of patients with a metered dose inhaler performing all essential steps correctly (Int J Chron Obstruct Pulmon Dis. 2008 September; 3(3): 371–384). Asthma patients using inhaled drugs exhibit a similar lack of adherence and poor technique (Prim Care Respir J 2011; 20(2): 148-154). VeriHaler* uses wireless acoustic monitoring to provide valuable feedback to the user, clinician or healthcare provider through promoting correct inhaler usage and rapidly detecting any deterioration in a patient’s condition. The core sensor technology incorporates a small, inexpensive condenser microphone attached to the device casing. It is non-invasive in the drug flow path and does not affect inhaler performance. It can be retrofitted to an existing inhaler platform and works with both metered dose (pMDI) and dry powder (DPI) inhalers. A proprietary algorithm removes unwanted background noise from the acoustic signal and extracts key information about the use of the device. For example, parameters such as peak inspiratory flow rate, timing of breath-actuated firing mechanisms and the delivery of the drug formulation itself have all been successfully extracted. It also records time and date of usage. User feedback and remote connectivity to the carer is critical for the success of this system. 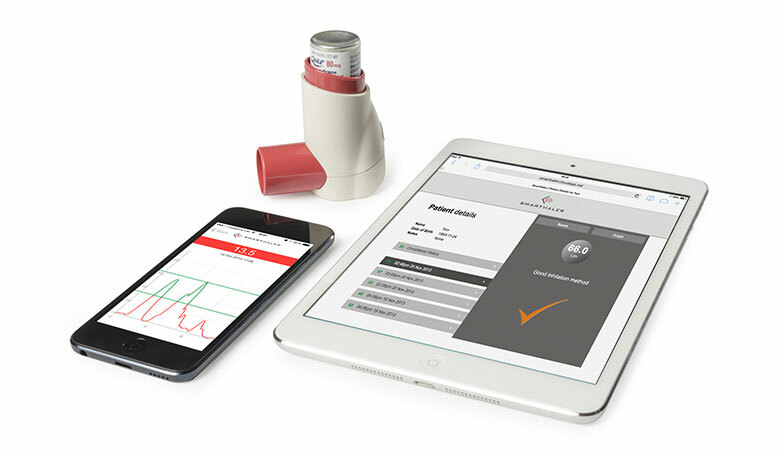 An iPhone App communicates with the inhaler via a Bluetooth® Low Energy connection. The iPhone user interface has been designed to ensure that the user is presented with clear, actionable information on the level of their compliance. The App is also capable of logging peak flow data (either from a Bluetooth connected digital peak flow meter or simply via user input). This allows the patient to spot any deterioration in their condition early on. Finally, the logged data are then uploaded to a cloud server via a secure connection. This feature enables a secure web portal, through which the patient and the clinician can review these data during a consultation and can rapidly determine whether or not, for example, any deterioration in the patient’s condition is related to poor compliance or simply inappropriate medication. The figure below shows many of the challenges that we are addressing in the development of this novel system. In particular, we anticipate the App will be regulated as a Medical Device in accordance with the FDA’s recently released guidelines on Mobile Medical Apps. 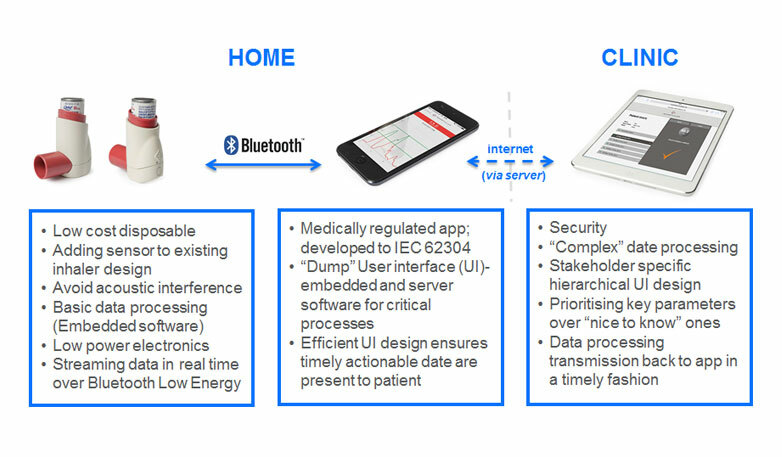 This means that the system must be carefully designed to ensure that critical data processing steps are not carried out on the smart mobile device processor, but either within the medical device or on a remote server. Elements of the technology have been used by two pharmaceutical companies in their clinical trials (one pMDI, one DPI). Drug delivery devices - does the toolkit need changing?